Greek five-piece Aeklypsis started life as an Ensiferum cover band, of all things, yet this, their first recorded output, is very impressive. Something like old-school Dark Tranquillity meets Old Man’s Child, Mirror Of Darkness is ambitious, skilful, and very enjoyable, more than showcasing the band’s instrumental and compositional skills. If anything, it’s too much, occasional dips into chaos fuelled by overindulging in female vocals – the band need to learn to give the music room to breathe. 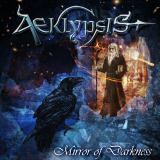 That’s the one criticism of Aeklypsis that really needs to be made, otherwise, the band are on a fascinating path sure to appeal to those who pine for the old days of melodic death, who prefer Wintersun’s approach to the genre to Soilwork’s. Of the three songs here, all have something to recommend them. Opener Winter rockets along, prog-tinged structural changes coming fast under a thick layer of guitar flamboyance and surprisingly un-irritating keyboard work. If anything the next track is even better, as effective clean vocals driving a melodic assault, varied and diverse riffing from Erevos and Aeon whips up a storm, again capably backed by keyboardist Nemetor. Ravenhell, meanwhile, starts with an old-school Maiden-esque melody sped up, before launching into thrashy solo-driven heaviness. All the musicians involved play their hearts out, and vocalist Kerveros excels himself, switching between Mikael Stanne snarls and Glen Benton roars in style, even managing distinct and sharp-edged clean vocals. It’s easy to see this sound being stretched to fill an entire album’s running time, and I do hope that Aeklypsis get signed off the back of this, as it’s better than much of the identikit melodeath nonsense being pushed these days. At just over fifteen minutes in length, this EP is over far too quickly, and I look forward to hearing more from these guys, a genuinely pleasant discovery and a real talent to watch for the future.